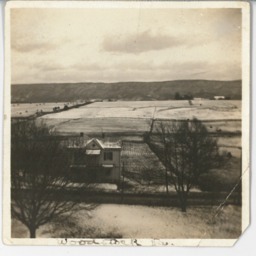 Photograph showing an unidentified farmhouse in Woodstock Virginia. Most likely the image shows the area across from what is now Massanutten Military Academy. Unknown, “Woodstock Va.,” Shenandoah County Library Archives, accessed April 22, 2019, http://archives.countylib.org/items/show/11702.